Rank Recognition is an official peer recognition and celebration of your current rank. 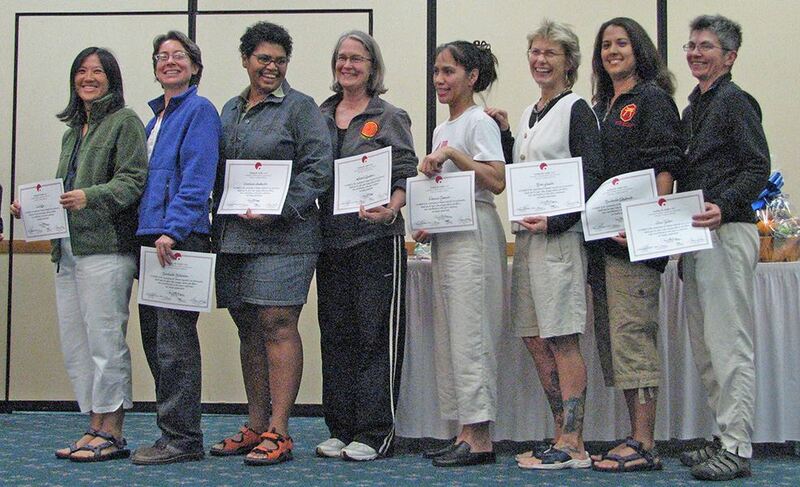 An AWMAI Rank Recognition Certificate also indicates to your students and colleagues that you are a member of an international community of women martial artists representing myriad styles and systems. This program allows us to honor you, and supports the work of AWMAI. Let us celebrate you at our next gathering! If you were promoted during the past year, please consider adding this acknowledgement of your accomplishment. Rank Promotion is available to members who desire rank advancement to the ranks of 2nd - 6th degree Black Belt, but currently do not have a teacher to promote them. Applicants must meet the requirements and are reviewed by a committee of senior women martial artists from a variety of styles and expertise. Honorary Rank Promotion is awarded in recognition of a woman's outstanding training spirit, as well as her contribution to the martial arts community and women's empowerment. Reviewed on a case-by-case basis, honorary status maybe awarded when a woman is no longer able to teach due to medical considerations, or may be awarded posthumously, in recognition of her lifetime achievements. Questions about anything on this page? Send an email to the Certification Director.